I remember as a kid, going to school in NDG and making the regular rounds in Montreal West, the Burger de Ville location there almost always had a huge line-up. It would snake outside on the sidewalk at any given time of day, rain or shine – testament to the place’s popularity. Before my piano lessons in the area, I would go pick up a cup of fries or a single burger to snack on. Those were the days. I’m surprised that we haven’t reviewed Burger de Ville on the blog sooner. It’s an old favourite that I guess we just haven’ t been to in a while. After eating Japanese food non stop for fifteen days straight (don’t get me wrong, I love(d) it) I had a huge craving for a big, juicy burger for when I got home. 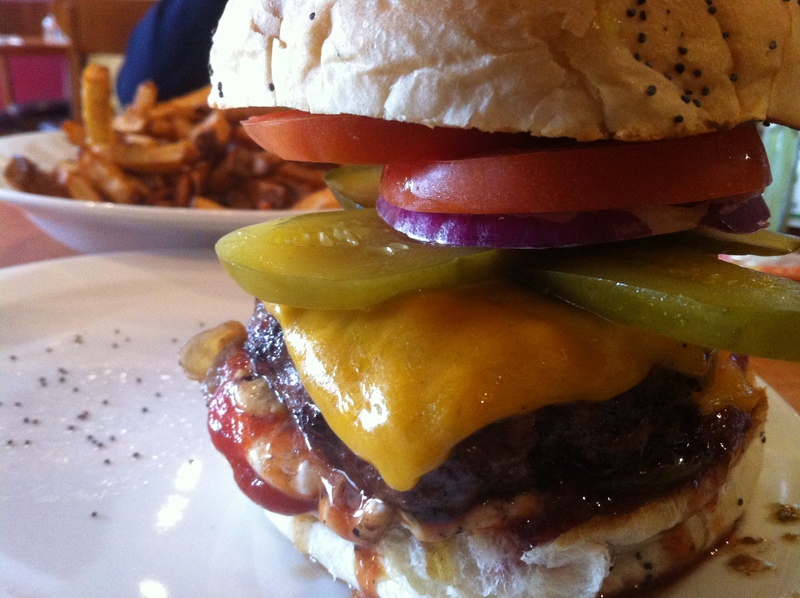 I had been dreaming about the Burger de Ville burger for a relatively long time so we headed to the St. Laurent location over the weekend to hit the sweet spot. 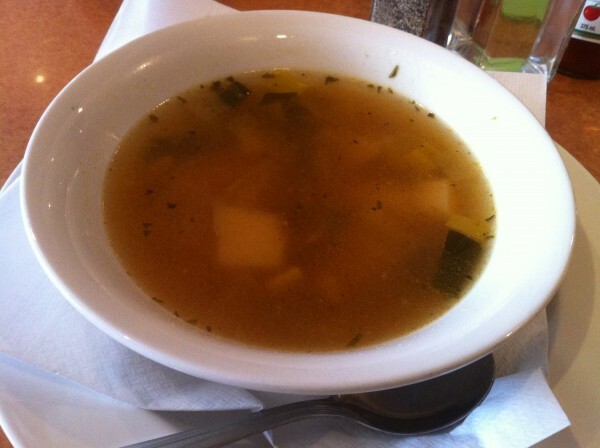 Looking to combat the cold outside, I got the soup of the day which happened to be potato leek. Simple, with an almost clear broth, chunky pieces of potato made this soup heavier and more wintery. Two packets of Premium Plus crackers came along with it. We both got cheeseburgers with a variety of different toppings. I got mayo, red onions, lettuce, pickles, tomatoes, caramelized onions, ketchup and old fashioned mustard. 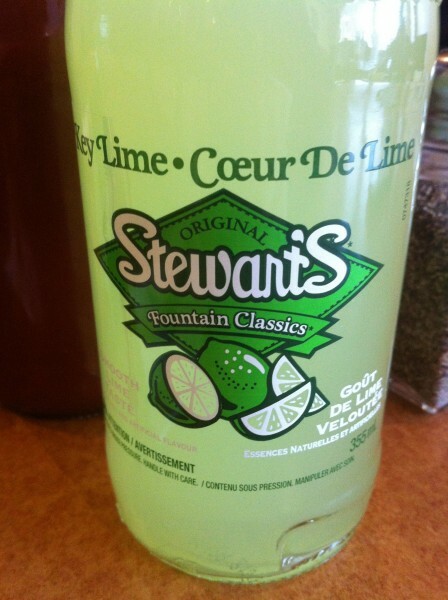 My friend got something pretty similar, subbing mayo for harissa mayo and pickles for jalapeno peppers. 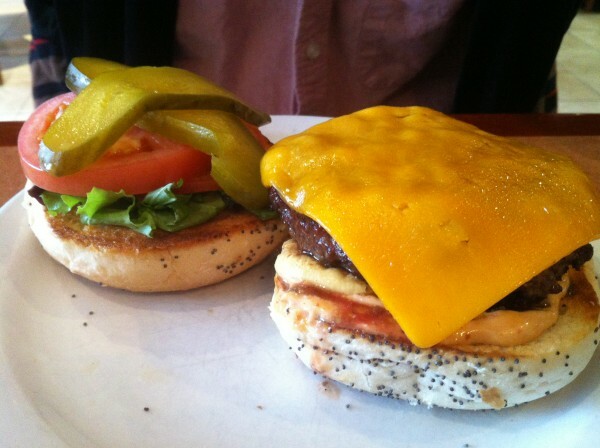 The patties are thick, generous and in our case, cooked to medium wellness. Just slightly pink on the inside, the patty tasted as fresh as the restaurant’s slogan boasts: “Always fresh, never frozen!”. The toppings piled on from all sides helped add tons of flavour and contributed to the juiciness of the burger – sauce ran down my fingers and palms and by the time I was finished, it definitely got a little messy. 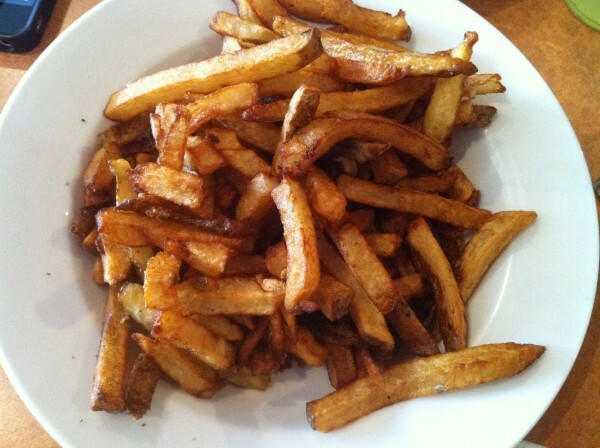 Smacking our lips and digging into the fries, we doused them in vinegar to give them a nice sour, tart taste. Yum. We left content, bellies full. As for my craving? Fully satisfied. 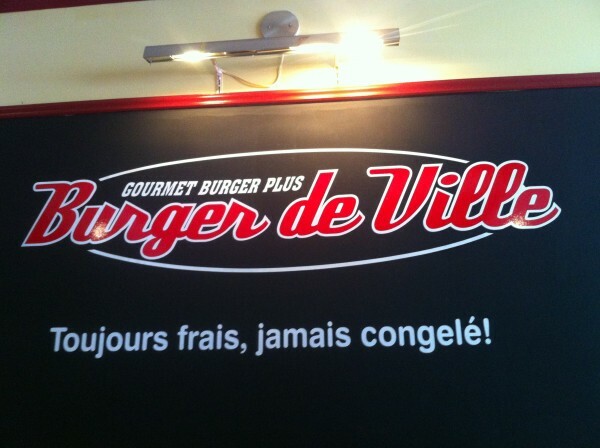 Tags: Burger de Ville, Burgers, Dinner, Fries, Lunch, Montreal, St. Laurent. You actually ordered soup there? Yup. Was in the mood for a soup. At Burger de Ville, it is what it is. Nothing fancy but does the job.